The work of TP/A … our work … concurrent to our research and design, explores the ability of Architecture, Objects, Services, Landscape Design, etc. to ‘create place’, or defined in better terms, to help us locate ourselves in the places we are creating and to make them exciting venues of continuity and discovery. For us, it is not enough simply to survive in our houses, shops, offices, and cities, but rather to thrive in them. This text by Michael Malztan appeals to us in it’s ability to describe the process of the deconstruction of the traditional city as the primary model for an urbanized future … it describes how Los Angeles is in the process of consistently creating itself without preconception. Los Angeles is not concerned about being a classical city, or maybe even in calling itself a city … it is concerned only with calling itself, and the places within it, simply what they are. Despite the fact that Los Angeles is perhaps not a ‘true city’, it is nonetheless, a series of connected places, pushing the limits of what cities are, or what they will one day be, regardless of what we call them. Due to the trajectory and linearity of the infrastructural patterns of Los Angeles, inherently, intertwined in this connected stream of places, we find an endless pool of non-places, those lost areas ‘in-between’. These abandoned zones, desperate and discontinuous as they may be, offer opportunity in this multicultural, unfinished laboratory. In our academic work, we have been researching these new and often desperate ‘non-places’, analyzing and proposing new and exciting models of inhabiting them, using strategies large and small. 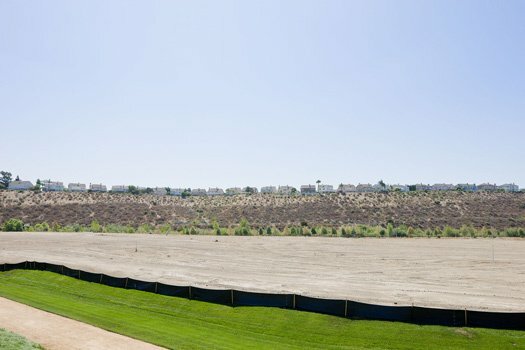 This article, in addition to its description of the current conditions of LA as an unfinished urban experiment, also discusses these residual ‘no-mans lands’, and how in part they are being re-inhabited with intent. Los Angeles. All photographs by Iwan Baan, courtesy of No More Play / Hatje Cantz. I chose to live in Los Angeles. For many who come to this city, the decision to do so is often based on a job, family, a relationship, convenience, political reality, the weather, school, cars, art, science, media, hope, music, the beach, opportunity, or a random turn in life. My desire to be a part of Los Angeles was undeniable and decisive. I was drawn to Los Angeles because it seemed real — perhaps the most real place I had ever known or been exposed to in my life. I had spent most of my childhood on the East Coast in traditionally suburban and nonurban American towns. In college, I moved to Providence and Boston, which can easily be described as traditional cities and urban centers. Those cities never seemed to fit, leaving me with a nagging sense of incompleteness. Looking back, I needed more complexity. At first impression, during a week-long trip to Los Angeles while in graduate school, the city presented itself to me as a series of colliding events and interactions. Multiple cultures and landscapes emerged through the light of the overexposed horizon in flashes of contradiction: fertile and arid, dark and blinding, restrictive and generous — spaces ripe with inconsistency. Slowly, the city’s form revealed itself around me, incomplete and genuine. I knew at that first moment that Los Angeles condensed all of the challenges and all of the possibilities of the contemporary city and resembled the future of what was to come. At first, my reaction to Los Angeles was the opposite of the reaction of most people, who find the relentlessness frightening, numbing or overwhelming. Instead, the sprawling, horizontal city-plane; the peculiar, verdant confusions of nature and garden; the mineral-like opacity of the light; and the constant pace of movement were eerily familiar and comfortable. Los Angeles felt like home. I grew up in Levittown, in the middle of Long Island, New York — a postwar suburban development. Developments like Levittown — built by William Levitt in the 1940s, 1950s and 1960s — were self-contained communities of houses, schools and shopping centers planned around the automobile. Slowly the newness of these developments wore off, and people began to adapt to the formally sterile, endless rows of cookie-cutter homes. While Los Angeles and Levittown have had different life cycles, they share this primal makeup in their inception, making both cities familiar, development-centric American landscapes. Observing Levittown on its own terms at such an early age erased any preconceptions I had of what defined a real city. I did not fixate on iconic or singular forms, nor was I fascinated with the everyday. Subtle qualities and diverse, ambient experiences stood out in the repetitious and seemingly monochromatic Levittown landscape. I found order and connective threads in the subtly shifting patterns across the façades of the tract houses, the calculated variations of shingle types, the periodic blooms of wild weeds in the storm sumps, the intense light in a place with immature trees, and the landscape of the in-between. My familiarity with Levittown caused me to distrust the traditional context of cities and instead focus on the equally compelling subtle characteristics of place. I developed techniques of discrimination and perceptual tool sets with which I could identify specific environmental qualities, rather than evaluating a city by the generic tools of traditional formal urban thinking. I returned to Los Angeles two years later as a permanent resident and fell back into the sprawling environment, wondering if my newly minted education in architecture would help or blunt my capacity to understand subtleties in the urban setting. Perhaps I had previously romanticized the relentless terrain of Los Angeles. But by the time of my return, my perception of the scale of the city had changed. It was now an unending conveyor belt of diversity and iteration. As I look back, I recall memories from that time of successive, lovely, serpentine journeys through and across the city. As a montage of images and impressions, the memories have no beginning or end — just the pleasure I found while riding within an unspooling stream of experiences. My perception of the city changed once again in 1992, soon after my return. It was a typical day in Southern California, the relentless sun was beating down from the sky; then, instantly overnight, Los Angeles erupted into violent rioting. A social upheaval long in the making, the devastating events of that spring exploded across the landscape after four white police officers were acquitted for the videotaped beating of an African-American, Rodney King, after a high-speed pursuit. Preconceptions of our stable, diverse, multicultural city were turned upside down overnight and were replaced both physically and psychologically with the realities of a newly battered, confused metropolis. As the fallacy of an integrated Los Angeles was challenged, the lines and forms of the city’s distinct districts appeared. The divided social constructs of many cultures formalized. While the city was still in the throes of collective shock, clarity emerged through the formal and psychological reshaping of its identity. At this extraordinary, acute moment of focus on my surroundings, my instinctive emotions took hold. The Los Angeles that I intimately knew evaporated from my grasp and was replaced by a new beast: unfamiliar, raw and fragile. The violence and rioting were not the nexus of the transformation of the metropolis, but instead, after a long period of change, they were the apex. The commonly accepted characterizations of the city before that moment — a horizontal, suburban, center-less city; a place of sprawl and smog — now seemed almost romantic and quaint in the face of what Los Angeles had become. Los Angeles was no longer the historic city of our parents and grandparents; it was now a different creature. Los Angeles’ relentless growth has never paused long enough to coalesce into a stable identity. Los Angeles and the surrounding regions have grown steadily since the founding of the original pueblo, but the period immediately after World War II defined the current super-region. During this time, the economy accelerated, and Los Angeles became a national and international force. Today, innovation and development define the metropolis as the region multiplies exponentially, moment by moment, changing into an unprecedented and complex expansive field. The region continues to defy available techniques and terms in modernism’s dictionary of the city. Constant change defines the core character of Los Angeles and facilitates its relationships with other emerging contemporary cities. As we continue to wrestle with new urban issues presented by Los Angeles, negative or positive, it is likely that the same issues will occur in other locations in the global society. Los Angeles has been compared to a laboratory — an urban ground for experiments both prescribed and accidental. Laboratory is a perfect word. Enveloping, chaotic and mutable, Los Angeles is a nocturnal workshop where the constant experiments leave no time to tidy up and reset the data in order to start fresh in the morning. In Los Angeles, you are both the experiment and the scientist. One is forced to be the object of fascination and fray, while simultaneously judging and monitoring the urban experiment. The rare emotion of being watched while also watching cajoles one to continue to refine and reevaluate his or her perception of the city. And the city constantly repositions itself at a different acute angle and offers a new data set. My thoughts are focused on Los Angeles at this moment not only because of its usefulness in general urban studies; nor am I interested simply because of my personal history and fascination with the city. I believe that Los Angeles is now at a pivotal moment where the general equation of what it is and has been is being redefined. Los Angeles’s new identity is being determined. The critical moment is precipitated by two simultaneous realities: the exaggerated geographic boundaries of the city and the continuing appearance of new densities. The prototypical suburban context of the city has given way to an emerging context of real physical intensity and population density. The indicators are visible. Higher levels of new infill buildings and projects are being developed. Large masses of buildings form suddenly in empty lots. Easy mobility decreases as the freeways turn into virtual gridlock well before and well after the traditional rush-hour expectations. Mass transit hubs have emerged. And, most surprising of all, development using existing buildings in leftover and in-between building sites has increased and is resulting in a new urban palimpsest that was unheard of even five to ten years ago. Los Angeles has long been able to lay claim to being a dense metropolis. One only needs to observe the city through the small plane portal upon arrival at LAX to understand the complete, continuous carpet of occupation and construction. But the sprawl of yesterday is being built upon in novel ways, causing density’s newest iteration to be greater in scale and mass than ever before. And the new density has imposed psychological effects on the city’s collective identity, suggesting that a boundary or limit of the city-region of Los Angeles has finally been reached. From Los Angeles’s inception, the city has defined itself by its ability to continuously push the outer edges farther and farther out. Our temperament of expansion, which is tangent to Western thoughts of manifest destiny, resulted in disposable built landscapes and a defined horizon of endless development. The remaining artifact is both the iconic image of Los Angeles and the poster child for arguments about late-capitalist sprawl cities. Now the bounding perimeter of the city has been hit, and perceptual, psychological and physical limits of what it means to be in Los Angeles have arrived. Part of this is purely pragmatic and a function of the real constraints of the region’s physical geography. Bounded on three sides by the San Bernardino Valley, the San Gabriel Valley, and the Santa Monica Mountains — and defined by the Pacific Ocean — Los Angeles has always been a city with physical limits. Geography, however, is only part of the story in the transitioning identity of the city. Development will continue beyond the periphery of the city into the outreaches of adjacent deserts and valleys, but it is highly questionable how the new development will relate to Los Angeles. The debate about limits can be reduced to a philosophical exercise, but greater ramifications are found in the resulting question for Los Angeles: what is the new identity for a city whose entire life has been marked by its ability and desire to endlessly expand? Perhaps the lack of perceptible hierarchies — or, likely, the reality that traditional thresholds and boundaries in this city are hidden and constantly transgressed — makes Los Angeles a difficult case study in the urban milieu. Intuition, phenomena, perception and experience are necessary tools to make sense of this place. In many ways, the real task is to take on the challenge to move beyond traditional nomenclature and to understand the nuances of the form of Los Angeles in a case-by-case manner. One could bemoan the current reality of Los Angeles as the inauguration of the endgame of a remarkable city, but it is exactly the opposite. As inhabitants of a city that is continually confronting change, we possess an inherent creativity and ability to constantly surprise the world with our inventiveness. We are witnessing the beginning moments of Los Angeles’s latest transformation. The delicacy of this moment for architects, urban theorists, landscape architects, designers, planners and city leaders requires keen investigation to produce forms that represent this city and its culture, as opposed to importing other urban models. Those models will not work in Los Angeles. They will eventually wither in the hard light that outlives all forms here — because only Los Angeles is Los Angeles. Our goal and responsibility is to remember that the opportunity to redefine the city based on its own willed, creative responses will allow Los Angeles to become even more itself. Other cities in their youth, such as New York and Chicago, have undergone moments of transition and redefinition that are not only apparent in the resulting skylines, but can also be felt in the underlying sense of each city. Extreme scales of activity, development and social intensity are evident in the examples of powerful metropolises. The same indicators are present in Los Angeles. We are about to tip over, accelerating at an unrelenting pace. We have reached a point where past vocabularies of the city and of urbanism are no longer adequate, and at this moment, the very word city no longer applies. First, we must develop a new approach to understanding this moment and acquire the proper additional vocabulary to describe what is around us. Or not. Perhaps the best approach to understand the city’s high-velocity transformation is to step back and observe the visible complexities, ambiguities, activities and forces. Los Angeles is a place of constantly overlapping layers, complications and evolutions. As an evolving being, its dynamics make description difficult. Perhaps it is not a city — perhaps it can only be described as Los Angeles.